till recently, restoring the pristine beauty of the famous Dal, Nagin and Aanchar lakes seemed an impossible task. But a recent court directive on the cleaning of these water bodies has rekindled hopes. In a significant judgment, a two-member division bench of the Jammu and Kashmir High Court, comprising Chief Justice B C Patel and Justice Muzaffar Jan, directed the state government to take specific measures to give a new lease of life to the three lakes. The court has banned all construction in the vicinity of the lakes. Washing of vehicles is also prohibited in and around the lakes. The inspector general of police (traffic) has been accorded the responsibility of taking action against those violating the order. The Srinagar Municipality and other developmental authorities have been directed by the court to take steps to prevent the use of polythene in and around the lakes. In addition to this, the bench has also ordered the state pollution control board (pcb) to monitor the functioning of small industrial units around the lake -- particularly their waste disposal methods. Regional Director of pcb Shuja Hydri said that the court order is binding on them and they have already begun acting on it. Following the directive a comprehensive action plan is being formulated by the divisional administration for the preservation of the lakes. Houseboat owners, too, aver that proper implementation of the order will restore the lost glory of the lake. 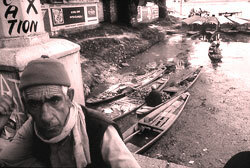 "The polluted lake deters tourists from taking boat rides, which affects the livelihood of the local people. The order is therefore in the interest of the community as well that of the environment," said Abdur Razaq, chairman of Houseboat Owners Association. The court acted on a petition, filed by a law student which was later treated as a public interest litigation.